If you’re staying in Florence, chances are you won’t run out of things to do. But if you want to make Florence your home base and venture out to see the surrounding area, here are three easy day-trip ideas. Probably one of the most popular side-trips from Florence, Siena is a medieval city built upon three hills that converge at its main square, Il Campo. 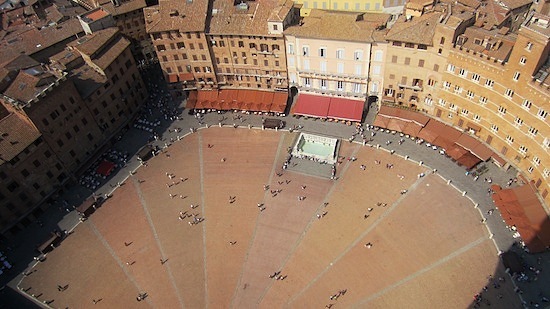 Twice a year in July and August, the square fills with thousands of spectators for the Palio horse races, a tradition that dates back to the 17th century. Regardless of what time of year you visit, there is no shortage of things to see, from the city’s Duomo to the Pinacoteca filled with medieval art. A must-see is Palazzo Pubblico, the city hall at the focal point of Il Campo, which houses the fresco-adorned civic museum. 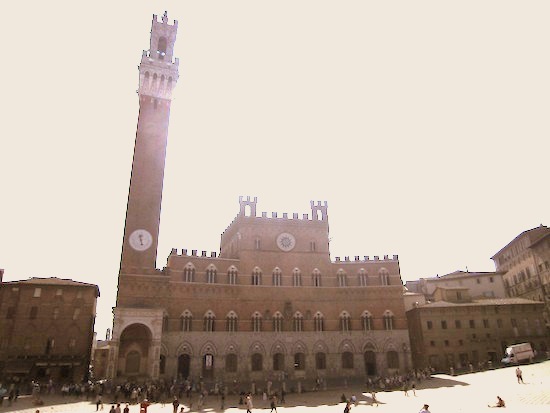 If you’re feeling adventurous, you can also climb the 330-foot city tower for a stunning view of Siena’s signature brown rooftops. While many travelers may be content with taking up a seat at a café on Il Campo, others may enjoy exploring the city’s maze of hilly streets. Keep an eye out for the colorful flags that correspond with each of the 17 contrade or neighborhoods of Siena and their equally as colorful mascots, like a goose, unicorn and other medieval creatures. 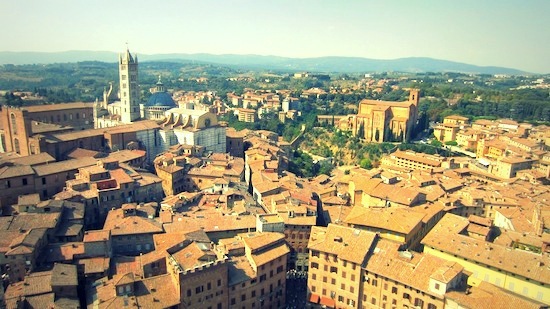 How to get there: The easiest and fastest way to get to Siena is by bus. The SITA bus station is just west of Florence’s Santa Maria Novella train station on Via Santa Caterina da Siena. Buses run twice an hour and you can buy tickets at the station. Try to catch one of the buses labeled corse rapide (they’re faster, a little over an hour versus nearly 2 hours), and get off at the Piazza Gramsci stop along Via Tozzi in Siena. When you’re ready to go back to Florence, there’s an underground stairwell across the street from the bus hub, in front of the NH Excelsior Hotel, where you can buy tickets. Go to www.sienamobilita.it to view bus timetables. This is an easy two-for-one day-trip from Florence, especially for travelers who want to make a quick stop in Pisa to check the Leaning Tower off their bucket list. If you decide to climb the tower, reservations are required so be sure to book your time slot in advance. If not, you can still see the tower from the outside, along with the Duomo, Baptistery and other sights on the Field of Miracles. Walk down the Borgo Stretto, the most elegant and expensive shopping street in Pisa (and the location where Galileo was born), or escape the crowds of tourists with a quiet walk along the Arno River. Nearby Lucca is a well-preserved medieval city, most famous for its ramparts. Atop the wall, which is paved and landscaped, you can rent a bike or walk the 3-mile loop for a scenic overview of the city. Within the walls, Lucca is also a great place to wander since there is very little traffic. Like other Tuscan towns, Lucca was once dotted with defensive towers, and the last of which remains is the Guinigi Tower near the city’s center. Climb to the top, where several oak trees grow, for an incredible view of the city. Similarly, the Torre delle Ore clock tower also offer great views, or you can pass your time shopping and strolling along Via Fillungo. How to get there: Trains run several times an hour from Florence to both Pisa (about an hour away) and Lucca (about an hour and a half), so you can start with either one of these cities. Check out the schedules at www.trenitalia.com. The best way to get between Pisa and Lucca is an easy 30-minute bus ride that connects the two cities, with convenient stops at the Field of Miracles in Pisa and Piazzale Verdi in the western part of Lucca. Then just hop back on the train when you’re ready to return to Florence. Look one direction and see hills dotted with colorful buildings and vineyards, and the other direction to see the crystal-blue waters of the Mediterranean. This day-trip requires a little more planning than the others, but the extra effort is well worth it. Each of the five villages that make up the Cinque Terre boast their own unique charm – be prepared for sensory overload! Walk the Via dell’Amore that connects Riomaggiore and Manarola, eat a delicious lunch of fresh seafood or pesto pasta in Corniglia, kick back with gelato from Gelateria Il Porticciolo along the water’s edge in Vernazza or take a dip in the Mediterranean in Monterosso al Mare. While there are many companies that offer organized day-trips to Cinque Terre where you’re guaranteed to see all five villages, you may also want to consider packing an overnight bag and stay for an evening in one of the towns before heading back to Florence. You can read more about my recent trip to Cinque Terre here. How to get there: If you want to forego an organized tour, take the train from Florence to La Spezia, which takes about 2 hours, usually with a train change in Pisa. From La Spezia Centrale, pick up another train to the southernmost town, Riomaggiore. The five towns are only a few minutes apart by local train, and you can buy individual tickets at the stations. Just be sure to check the timetables so you don’t miss the last train back to Florence. 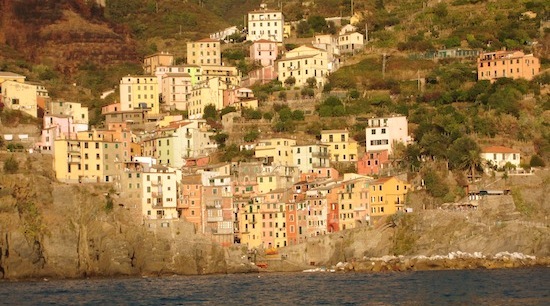 If you decide to hike between the towns, you just need to pay the Cinque Terre National Park entrance fee of 5 euros. More information can be found at www.cinqueterre.it. This entry was posted in Daytripping, Florence, Transportation. 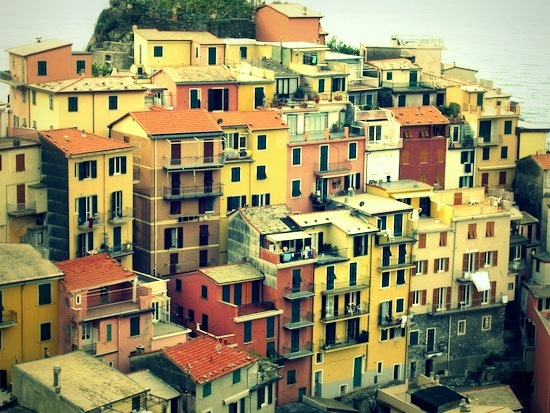 We are looking for an apartment in Riomaggiore or Vernazza for 3 adults. Can you help? 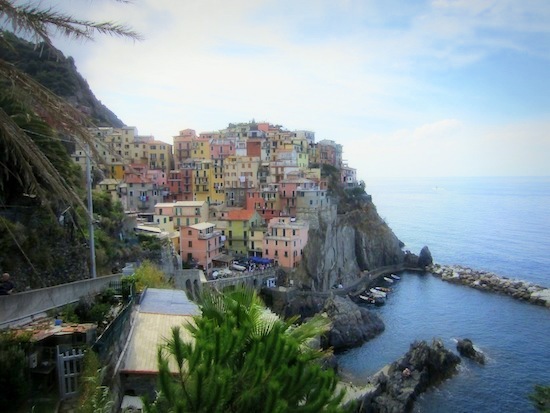 Check out Il Boma, in Riomaggiore, or maybe Caragiu B&B in Manarola. Nice picture of Pisa, I like how you got the sunset. It gives a nice pinkish tone to the tower and the other buildings. Usually you see them in pure white. Good post, very helpful, all of those places are very beautiful. The heart of Cinque Terre is located in the center of Cinque Terre National Park, right on the Sentiero Azzurro, between Corniglia and Vernazza, in a restful tiny village named ‘Prevo’ with an amazing and nonpareil panorama, away from the bustle of the villages.